Thank you for your visit and time at our booth at the Electronics Design show this year. Although an excellent introduction, as your Eurocircuits sales contact I would like to make sure that you have all the information you need about our company and our services. We are specialist manufacturers of prototype and small batch PCBs. Our goal is to help you speed up your product cycle and keep costs down by offering comprehensive added-value services with online pricing and ordering. Over the last 15 years we have developed a lean business model that delivers to our customers a wide range of PCB technologies fast, reliable and at low cost. For a full list of these services see the attached specification or go to www.eurocircuits.com. To ensure low prices without compromising quality or delivery we use order-pooling (or “panel-sharing”) technology, that is, we combine orders from several customers on a single standard production panel. 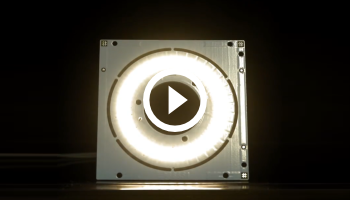 This keeps production costs down and we don’t have to charge for tooling or set-up. To access our full range of online services, go to the Price calculator on our home page www.eurocircuits.com. You can get a price and place an order immediately. Alternatively send me the Gerber data to quote for you. We are not brokers: all boards are manufactured in our own ISO 9000 approved factories in Germany and Hungary or for our new service BINDI pool in our new factory in India. All finished boards are given their own “passport” or Certificate of Conformity listing their manufacturing history, materials used and inspection stages they have passed. We offer deliveries from 2 days. In 2014 we shipped 78,000 orders. More than 98% were delivered on or ahead of time. Our online service means no delays in getting prices or placing orders. 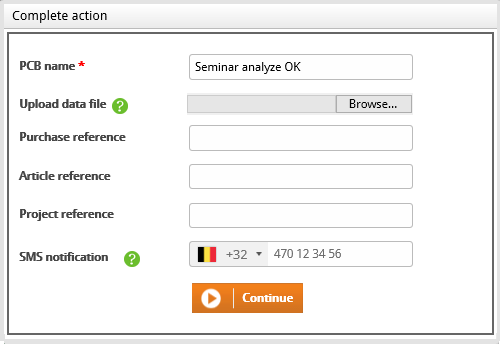 Check your data prior to order using our online PCB Visualizer and Checker. Is the data correct to the order and the design? Are there features that will delay production or push up the cost? An online pre-order check can save 1 – 2 days on time-critical deliveries. We check all boards 100% for manufacturability before production with clear feedback where required. Our 22 page PCB Design Guidelines outlines best practice to reduce costs and avoid delays to manufacture. 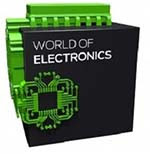 Visit our website www.eurocircuits.com for technical white papers and blogs on many aspects of PCB design and manufacturing. Manual assembly of SMDs is a time-consuming and fiddly process. Most sub-contract assembly houses are not interested in prototype or small batch quantities unless there are guaranteed volume orders to follow. 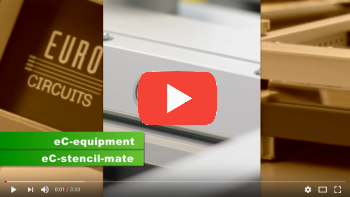 We have developed benchtop reflow equipment which allows you to assemble SMD boards quickly and cost-effectively in-house. Using our eC-stencil-mate printer and eC-reflow-mate oven, users tell us that they can cut manual SMD assembly times by up to 70%. Smart online menus for pricing and ordering provide real-time guidance on reducing costs and improving manufacturability. NEW: PCB PIXture your graphic design on your board. eC-stencil provided by the same data used for the PCB production ensuring accurate solder paste printing and is delivered together with the PCB. RF pool to specialise in cost effective RF PCB manufacture. IMS pool increasing in popularity, Insulated Metal substrates are a key material in the LED lighting industry. eC-equipment specially designed to aid the population of prototypes and small series PCBs: NEW: eC-placer. 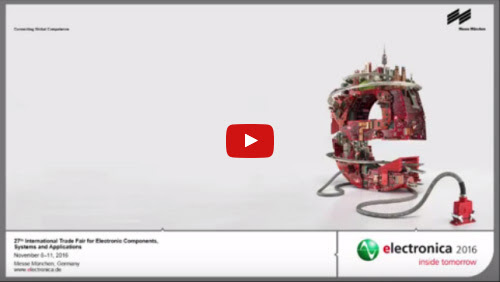 eC-consumables allow a one stop shop to produce your PCB’s. If you have any questions please call me on 07794 906982. And don’t forget to use your discount voucher. Eurocircuits launches SMS messaging for time critical orders ! 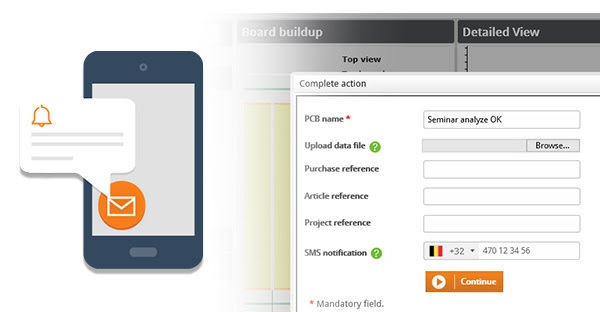 Whenever you are in need of a very fast turn around time for your PCB order or when you have a critical delivery to be made and you want full instant control of the production flow of your board, you can initiate SMS-massaging for your order. By just inputting your mobile phone number in the order input menu, you trigger the SMS-messaging service. On any of these steps in the flow you will receive an SMS calling for action on our website, or just notifying you of the next step in the flow: pre-production approval, exception, order confirmation, shipped, payment required. With SMS-messaging, you will not miss out on any important occurrence. Ricoh Arena, Phoenix Way, Coventry CV6 6GE, UK. You can find us at stand L46 from October 19th-20th, 2016. Free tickets can be obtained here. IFEMA – Feria de Madrid, Av. Partenón, 5, 28042 Madrid, Madrid, Spain. You can find us at stand 4D24 from October 25th-28th, 2016. Free tickets van be obtained here. Use CODE “MA160000203XE” to complete the registration for your free ticket. Congrescentrum 1931, Brabanthallen, Oude Engelenseweg 1, Den Bosch, The Netherlands, 2nd of November 2016. Neue Messe Munich, Hall A5, booth 502 from 8-11 November 2016. We are proud that we can offer all of our Eurocircuits contacts a voucher for day ticket. https://www.eurocircuits.com/wp-content/uploads/Message_header.jpg 600 600 eC Admin http://www.eurocircuits.com/wp-content/uploads/2016/07/eurocircuits.png eC Admin2016-10-21 11:41:222018-05-14 16:56:39Eurocircuits launches SMS messaging for time critical orders ! Eurocircuits is out there this Autumn. Come and meet us. Come and experience our full range of PCB manufacturing services during the various events we are exhibiting at this Autumn. For most of the shows you can register for a free entry ticket on our web site. One big exception is electronica in Munich. Being the largest electronica event in Europe and probably wold wide, electronica charges for tickets. Therefore we are proud that we can offer all of our Eurocircuits contacts a voucher for day ticket. Hope to see you in Munich, hall A5 – booth 502, 8-11 November 2016. Your code above is unique and can only be used once. You may pass this code to someone else at your discretion. More or other codes are not available. Electronics Design Show – Ricoh Arena, Phoenix Way, Coventry CV6 6GE, UK. You can find us at stand L46 from October 19th-20th, 2016. MATELEC – IFEMA – Feria de Madrid, Av. Partenón, 5, 28042 Madrid, Madrid, Spain. Free tickets van be obtained here. Use CODE “MA160000203XE” to complete the registration for your free ticket. D&E event – Congrescentrum 1931, Brabanthallen, Oude Engelenseweg 1, Den Bosch, The Netherlands, 2nd of November 2016. Hope this may inspire you to come and meet us at one of the shows we are attending as exhibitor. https://www.eurocircuits.com/wp-content/uploads/Electronica_2016-1.jpg 377 377 Luc Smets http://www.eurocircuits.com/wp-content/uploads/2016/07/eurocircuits.png Luc Smets2016-10-18 10:00:402018-05-14 16:56:49Eurocircuits is out there for you ! We would like to thank all visitors that made use of the free entry ticket we have offered them. It made us win the Marketing trophy again. WoTS, an exhibition with 450 exhibitors and more than 21,000 visitors, is for sure a forum of technology worth your visit. 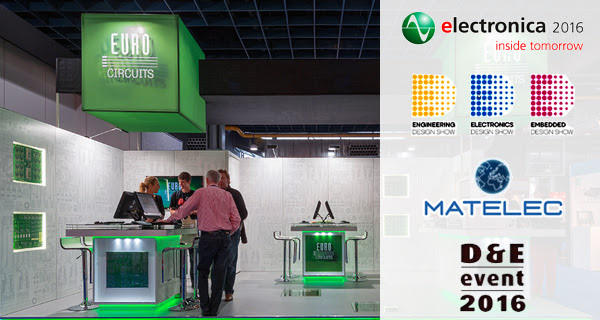 We are glad that the Eurocircuits community plays a significant role in this important BENELUX event. We willen alle bezoekers bedanken die ons aanbod voor een gratis ticket hebben aangenomen. 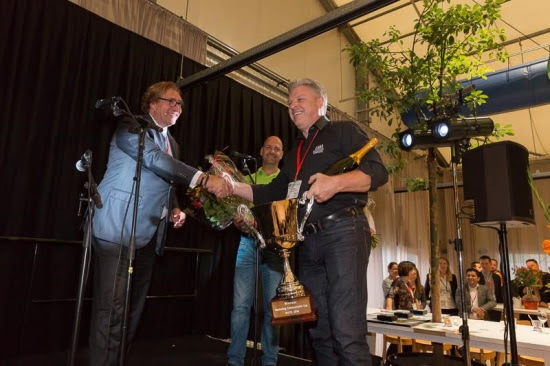 Hierdoor hebben we weerom de marketing cup gewonnen. WoTS, een beurs met 450 exposanten en meer dan 21,000 bezoekers, is een belangrijk technologisch forum en verdient uw bezoek. We zijn blij dat de Eurocircuits community een belangrijke rol speelt in dit BENELUX event. 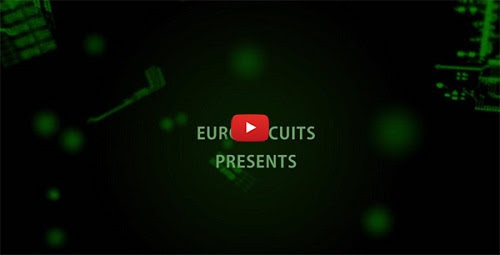 During the coming weeks, Eurocircuits will be present on lot’s of other events in Europe. We will update you next week. 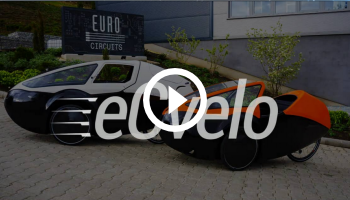 U zal Eurocircuits de volgende weken nog op meerdere events in Europa kunnen ontmoeten. Volgende week meer info. We are on the move to Utrecht. 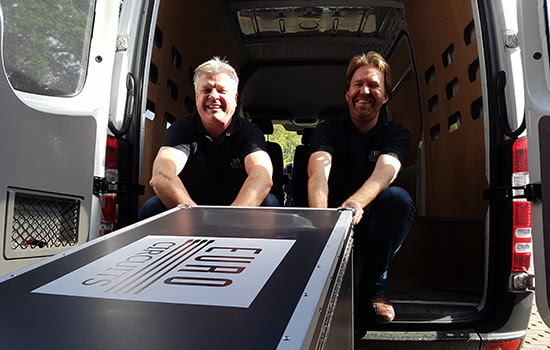 Exhibition stuff and eC-equipment is packed and we are ready to meet you all. The next 4 days you can find us in the Jaarbeurs Utrecht, hall 9, booth A066. Don’t forget to register upfront for a free entry ticket. It saves time at the reception desk. We zijn vertrokken naar Utrecht. Ons beursmateriaal en het eC-equipment is geladen en wij zijn klaar om u te ontmoeten. De volgende 4 dagen kan u ons vinden in de Jaarbeurs Utrecht, hal 9, stand A066. Vergeet niet op voorhand te registreren voor het verkrijgen van een gratis toegangsbewijs. Zo spaart u tijd aan de ontvangstbalie. Registreer nu als Eurocircuits klant via deze link en verzeker u van uw gratis toegangsbewijs.